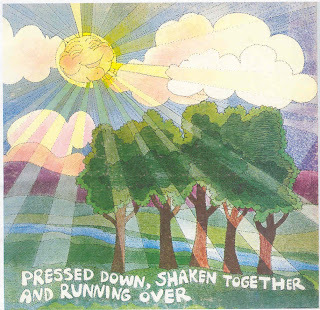 Pressed Down, Shaken Together & Running Over (Almond Tree 20423) 1975? Pressed Down Shaken Together & Running Over is Joe Fair, Paul Cuoco and Ralph Graham – three longhaired rocker dudes from The Way International. Their self-titled debut is an excellent independent release of melodic rural folkrock ala Crosby, Stills, Nash & Young. Songs like ‘Winding Binding, Goodbye Waltz’, ‘Hey, Whatcha Been Doin’, ‘Blessed Day’ and ‘Bright And Morning Star’ all have progressive hippie folkrock appeal, natural layered harmonies with a strong CSN bent, and a good balance of acoustic/electric guitar work alongside piano. Organ also works its way into a few cuts, including ‘The Blind Man’, ‘It’s Outside Of Your Mind’ and the heavy-rocking title track. Sometimes recalls the mellower side of Wilson McKinley. Paul Vergilio contributes electric guitar on ‘Christ Is Coming’ – he’s got a worthwhile lp of his own on the same label. Great cartoon cover of a happy sun shining down on trees. A second pressing exists on the WOW label from 1976 (WOW WPPD 104) with a different back cover. That version contains an additional track ‘Give A Listen’, but also shortens several of the others. (The Archivist, 4th edition by Ken Scott). I try to double check the web before posting and found the link to this group. I think you should write and ask them if it’s OK to post this. I did NOT see where the album is available from them and the player on their my space is not that good. I’d really like to hear this in a decent quality. Ditto the first comment. What I heard was great but I would like to hear it in better quality. I am attemptting to contact them. However until such time as I get their permission I will respect their rights. If I get their permission I will activate the download link. If it was your music I’m sure you would like the same respect. I have heard of the Group but don’t think I’ve seen any thing by them. I do have an album called the Lighthouse by the Word of God. They were out of Ann Arbor.